After spending years ignoring privacy concerns and the potential for its platform to be used by bad actors, Facebook has made itself incredibly vulnerable to criticism. The Cambridge Analytica scandal demonstrated how it could lose control of millions of users’ data, and it has served as a tipping point for public outcry and political pressure. A coalition of groups that includes Demand Progress, Move On, Citizens Against Monopoly and the Open Markets Institute sees an opportunity. 1. Facebook, Instagram, WhatsApp, and Messenger should be separated into four companies that operate independently. 2. Require interoperability between competing social networks. According to Axios, the petition will be accompanied a digital ad campaign that will target Facebook and Instagram users with simple messages like: “Facebook keeps violating your privacy. Break it up” and “Mark Zuckerberg has a scary amount of power. We need to take it back.” The ads will also run on platforms that aren’t run by Mark Zuckerberg, like Twitter. There’s certainly an argument to be made that Facebook is just one player in a broader systemic issue—almost any criticism one could level at Facebook would easily apply to Google. But when it comes to initiating drastic measures against a powerful company, timing is everything. Google may be formally cleansing its culture of the “don’t be evil” slogan that was part of its foundation, but Facebook is the one with the most high-profile scandals at the moment. Facebook unilaterally decides the news that billions of people around the world see every day. It buys up or bankrupts potential competitors to protect its monopoly, killing innovation and choice. It tracks us almost everywhere we go on the web and, through our smartphones, even where we go in the real world. It uses this intimate data hoard to figure out how to addict us and our children to its services. And then Facebook serves up everything about us to its true customers — virtually anyone willing to pay for the ability to convince us to buy, do, or believe something. The appetite for the federal government to step in and force Facebook’s hand seems to have hit a rare point at which it could enjoy bipartisan support. 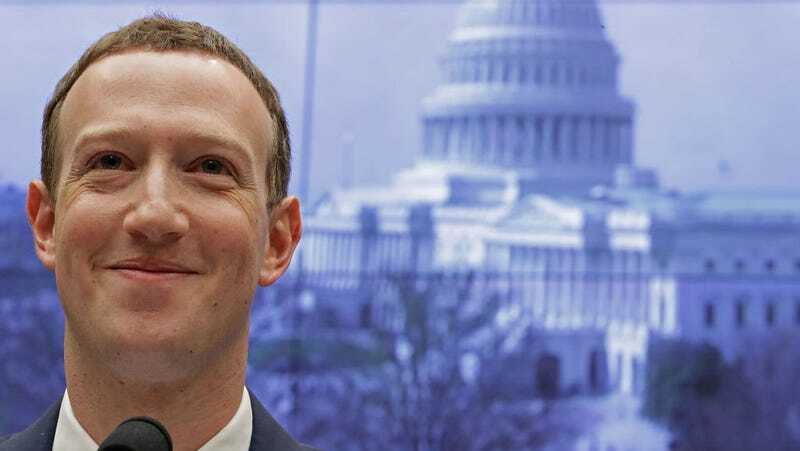 Zuckerberg faced criticism from both Republican and Democratic lawmakers at his House and Senate hearings last month. But conservative legislators often prefaced their questions and concerns with comments about their general opposition to regulations. Still, Zuckerberg repeatedly said that Facebook was open to appropriate regulations; however, he noted that a large company like Facebook can often comply with strict rules that would be onerous for a small startup. Singling out Facebook could be a solution to that problem. We asked Facebook for comment regarding the campaign and a spokesperson sent us a statement that repeated talking points the company seems to be sticking with—that it’s not the social media juggernaut people think it is. The statement argues that Facebook is operating in a competitive environment in which “the average person uses eight different apps to communicate and stay connected.” This has become a standard defensive point that Facebook flacks and Zuckerberg himself are relying on. Facebook doesn’t mention that it owns the top three apps in that category and has a history of ripping off the features of the other competitors. The timing is also interesting because last Friday marked the 20th anniversary of Microsoft’s landmark antitrust fight that it eventually settled. There are ample parallels between ‘90s-era Microsoft and Facebook, including a culture that believes it’s too big to be tamed by the government and a relentless dedication to dominating competitors it can’t out-innovate. That case is generally viewed as having set the stage for companies that spurred the tremendous growth in the tech sector throughout the aughts. And many experts believe now could be time for the U.S. government to set a new example in the social media age. The broad demands that Freedom from Facebook lays out in its petition certainly appear to be a long shot. Even though it’s uncommon these days, the U.S. has a history of nationalizing and breaking up large companies that run monopolies or pseudo-monopolies. Facebook, meanwhile, is dramatically expanding its lobbying team in Washington while it rushes through minor policy changes that it hopes will suffice. It also scored a major political win last week when Andrew Smith, one of its former lawyers, was appointed to oversee the FTC’s consumer protection unit. Smith has promised to recuse himself from the FTC investigation into whether Facebook violated a 2011 consent decree with its handling of the Cambridge Analytica agreement breach. But that doesn’t mean that Smith would stay out of deliberations over a forced breakup. You can find Freedom from Facebook’s petition here. Even if the group doesn’t achieve its goals, it’s encouraging users to follow its privacy guide to limit Facebook’s privacy invasions.